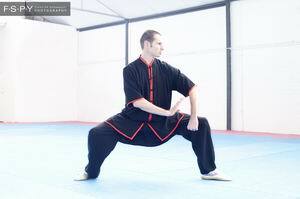 Tai Chi Quan is the most widely practiced Martial Art in the world. Famous for its ability to enhance health and relaxation, it was invented by Taoist philosophers who noticed that in nature, softness often overcomes hardness. Accordingly, they invented an art based on yielding and neutralizing an opponent’s force. The slow, circular movements of Tai Chi strengthen all parts of the body and improve flexibility, coordination and balance. 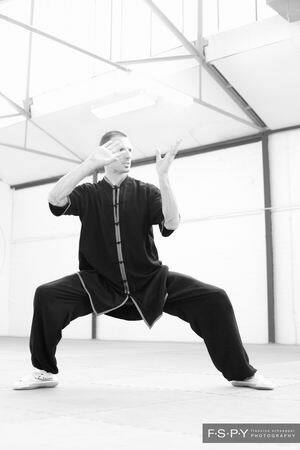 Legend has it that the basis for Tai Chi Quan was created by Taoists on Wudang Mountain, as a development of Taoist health exercises and self defence techniques. 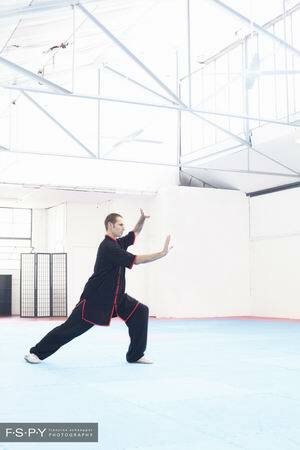 The swordplay in this particular style of Tai Chi was specifically developed for the Liu He Men (Six Harmonies) tradition by General Li Jing Lin, also known as ‘The Magician of the Sword’. In order to be able to easily access Tai Chi Quan, the Chinese Sports Committee brought together a number of experts in each style of Tai Chi in order to a create a central standardised style. The result were a number of forms that contained the essence of each major style of Tai Chi, such as the a 24 Movement Form, a shortened Yang style form, and the 42 Movement Form, which contains elements of Chen, Yang, Wu, and Sun styles. As these forms were designed specifically with accessibility in mind, they are much shorter and easier to remember than the much longer traditional forms. As such, forms from the Beijing standardised set are often the most popular ones to learn for beginners.